Life is full of surprises - and frankly its often the simplest things that prove the stumbling block. Take Argy's double-layout-full-pike-with-twist accident, recently. By the time the inevitable plaster cast had been applied, I thought I had the son-has-a-broken-arm checklist sorted. Garbage bag to cover arm in bath. Check. Knitting needle for itching arm. Check. Pillow to prop heavy arm up in bed. Check. Food that is easy to eat left-handed when you are a right-hander. Story to relay to strangers who stop and ask if it was a trampoline or clothesline (neither: stairs). Check. Yes, I thought I had it all worked out. That was until the weather turned a little chilly. I really didn't account for that. How does a 4 year old with an arm circumference of 12 inches wear a jacket or a sweater? I'm afraid the test was akin to that scene in Cinderella where the ugly sister tries to shoehorn her big foot into the dainty crystal slipper. Poor Argy. I decided to make him something with big sleeves and a generous neckline. 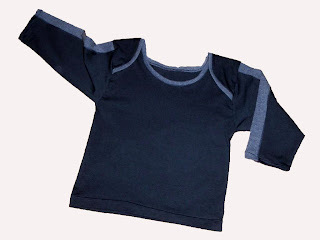 I started out by choosing a very simple pattern for a basic boy's long sleeved t-shirt. 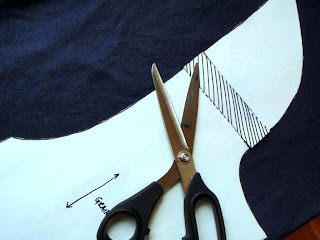 The pattern comprised just three pieces - a front, back and sleeve all cut on the fold. The pattern I used was by Kwik Sew and suitable for stretch fabrics only. Next I used the instructions from a tutorial by Dana of Made. Her terrific 90 minute shirt instructions describe how to convert a regular child's neckline to an envelope neckline. This is the sort that you see on baby onesies and really does make easing tricky arms into sleeves a lot simpler. Perfect for a broken arm ... though intended, I suspect, for much younger children (the neckline that is, not the broken arm!). Whilst Dana drafts the alteration straight on to the pattern, I left mine as a separate piece for the time being. You see the two pieces for front and back, below. The next task was to alter the sleeve size. I decided to add an insert of nice stretchy cotton ribbing into the middle of the sleeve. The pattern piece I drafted for the insert was a simple rectangle, as you can see below. 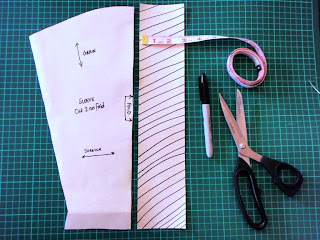 I also changed the cutting instructions for the original sleeve from being "Cut 2 on the fold" to "Cut 4". 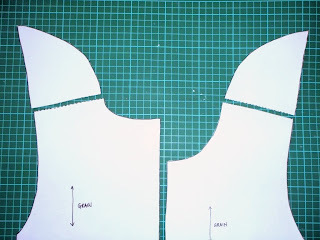 To be able to set in the much wider sleeve, I then made a change to size of the armscye (armhole) on the body of the top. To do this I added half the size of the finished insert (ie. 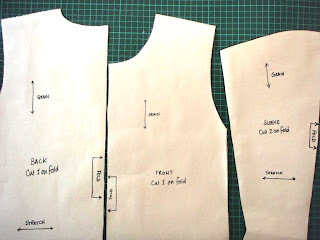 excluding the seam allowance either side of the insert), at the shoulder seam of the front and back of the top. Finally, I taped all the pattern pieces together for both the front and back. As you see below, the redrafted envelope neckline was taped on after I altered the armhole. All that remained was to cut the fabric. 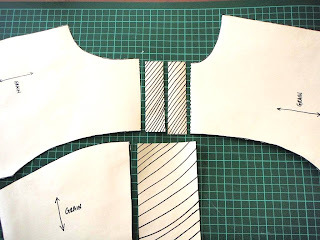 I sewed the inserts into the sleeves first, then followed a combination of Dana's instructions and the original pattern for completing the remainder of the garment. So hurrah - now Argy has a long-sleeved top that caters for a rigid bent arm weighing an extra one and half kilos! And thankfully I haven't yet heard that question: does my ... er ... arm .... look big in this? wow! That looks really great. I'm sure lots of kids with casts would be grateful for that. My arm wasn't broken, just cracked. I tell people it was because of a fly. It was. The fly bother the Shire horse, which city girl was walking round the BACK of at a country show and got caught in the kick aimed at the fly. Hope Argy is soon better, what a lucky boy he is to have such a thoughtful mummy!! Can I just clarify, my incident with the Shire horse was a gazillion years ago, when I was wee!! I broke my arm ( I fell off a donkey ) three weeks before being flower girl for my cousin, my mother put a zipper in the sleeve of my dress! I think your idea is great, Argy will love his new clothes. You are a such a good mummy! Can I strongly suggest a METAL knitting needle for scratching. My friend used a plastic one and it broke and they had to take the plaster off get it out and then put it back on..
Wow, you are the greatest Mum ever. The top is cool and practical too. You are such a clever cookie! Little Argy and Bargy are very lucky to have a mum like you. What a mum, easier to alter than the dreaded empire dress thingy, though, wasn't it? BTW hope you send this back to MADE or Made by rae, you just make the month of boy! I genuinely hope I never need to use this pattern (because by the time I ever got to finish it, the break would be healed - oh and I don't want the smalls to break any limbs). BUT this is an awesome solution, to what I am guessing is a big problem. Go MAMA! Well done you, my son who is now an adult spent a number of years over teenagedom in a plaster cast due to skateboarding accidents, he just yanked hoodies till they stretched out of all proportion! sasha had a broken arm when she was 2.5 (jumping on the bed, my biggest fear came true) and it was summer. someone in the fractures clinic suggested i ask for a waterproof cast (good since it was november) and voila - a lightweight purple cast that allowed swimming, bathing and no stinky skin when it came off. i hope he feels ok soon. YOU ARE MY HERO.... Hero Sewer and Hero Mumma. What a sweet thing to do for your limb challenged boy. And those alterations are damn impressive.